10 Best Driveway Alarm Reviews - Wireless Systems in 2019! One of the many security measures deployed in home driveways around the US is driveway alarm systems. Driveway alarm systems come in a variety of models and include a number of different features. The primary function of the alarm is to notify the homeowners of an approaching vehicle. Driveway alarms can come with a camera, as a wireless or wired system and may use be powered by man-made or natural energy sources. Wireless driveway alarms can be found in many commercial uses, such as a system to operate a motion activated lighting system or motion activated barrier or gate. What is a Driveway Alarm Sensor? A driveway alarm sensor is made up of two key units, a sensor, and a receiver. The sensor is positioned at the location or direction to which the oncoming traffic will activate a signal sent by the sensor to the main alarm. The alarm might not be an audio device, it can include a number of alternatives. In many comprehensive home security systems, the driveway sensor alarm is used to activate a camera that will record the oncoming vehicle or people. In other instances, it can be attached to a wide array of options that will become active the moment the sensor is triggered. There are downsides to sensor alarms, and these include the precision or fragility of the triggering mechanism that can lead to false alarms. This is why a good driveway alarm system is recommended and why I tested and found the following 10 systems to be the best options for a standard driveway alarm option. The decision to install a driveway alarm sensor is dependent on personal reasons. These can include living in rural area’s or living in the city within a walled compound where insurance requires tight security. In other instances, a wireless driveway alarm is installed for business purpose, to allow the business owner when a customer, visitor, and supplier is arriving. The driveway sensor, as mentioned above, will be connected to a larger system. In many instances a camera is activated, an outside lighting system is turned on, and even a gate or barrier becomes active, opening and closing based on the settings of the sensor. Driveway alarm systems come in many forms and are based on two varieties, a wired array or a wireless driveway alarm system. Sensors employ three types of detection methods; metal detection, pressure pads (rubber air hose) and passive infra-red (PIR). 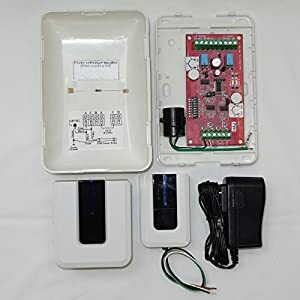 The wired alarms system requires a long wire connecting the unit to a power source as well as to the main alarm array. This system is more reliable but can be tampered with if the wire is found. That is why these alarm systems should be installed during the construction process of the property, to assure that the wire is secured in a pipe underground and in a wall. These systems do not require a private energy source, and as such cheaper to maintain as well as more reliable. Their alarm trigger is also more reliable since it uses ad direct link. Wireless driveway alarm systems are abundant since most homeowners do not build their house with the alarm installed. These systems require a local or individual power source and rely on WIFI or another radio linkage to send the alarm trigger. These units are costlier to maintain and can become unreliable when the power source loses energy. Their advantage is that they can be placed virtually anywhere without worrying about direct linkage issues and as such is a preferred system to build up properties. 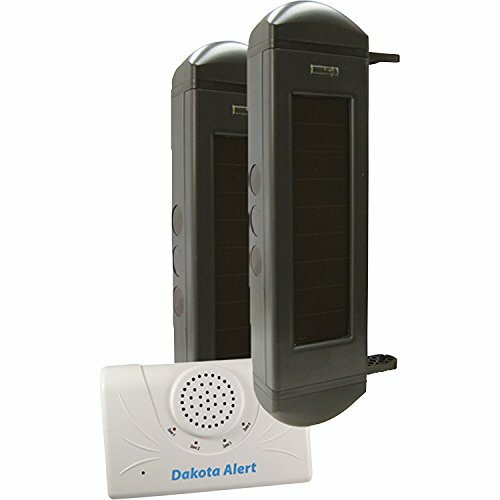 Dakota Alert is an American company with over 25 years of proven reliability and good quality products. After reading up some Dakota driveway alarm reviews, I decided to test out their systems myself. I will start off by saying that BBA-2500 is a wireless system that relies on a solar panel as well as batteries for energy. This combined energy source is great in the sunlit days of the year, and the battery kicks in during the winter and fall seasons. The system has a ½ wireless mile range which makes it better than most competitors, but also prone to false triggering. This alarm is that its an alarm, no fancy additions, you can get it in four different tones that include; Classical, Westminster, Ding-Dong, or Whistle. You can power the volume control, using a 12 VDC output and relay output. The beam sensor is powered by solar panels and is mounted at a distance of up to 300 feet apart. The sensors will send a signal in any weather condition. Safety Technology International, Inc. is another American company, and their- STI 34101 Wireless Sensor is used with the STI 34100 alarms system. The STI 34101 uses solar power and is sold separately from the solar-powered STI model 34100. This additional sensor is used to extend the range of the ST 34100 system. Since STI is a modular system, you have to buy all the components separately, which is something I find both a positive and negative options. The positive side is that you can design whatever system you want; the negative is that they don’t give you a comprehensive all in one solution option. 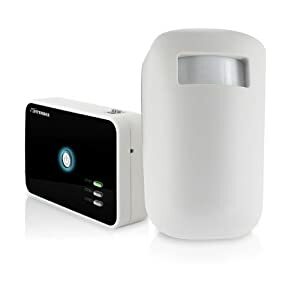 The receiver is STI model 34104 or 34108 and will alert you when the sensor is triggered by either a chime, a flashing light or the combination of both. The sensor uses a magnetic field array that detects large quantities of metal (iron based), which are found in all vehicles. This is why this system will not be triggered by large animals, which leads to less false alarms. On the other side of this positive is the fact that it will not trigger when a human passes it on foot, so it is not a good detector for people. The sensor needs to be placed within 1,000 feet of the line of sight from the receiver, howe3ver I find that the best performance is reached when the receiver is only 500 feet away from the sensor. 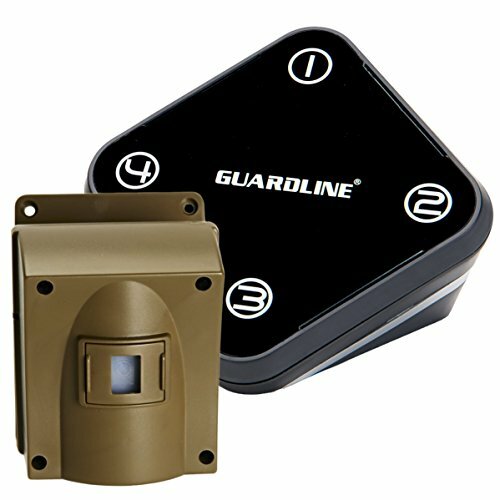 Guardline is an American company with many years of experience and over two years of full product testing behind every model they release. This model works in most weather conditions and comes with an adjustable detector that can focus the beam or direction to reduce false alarms. The unit is really easy to install, and if you want multiple locations, then you will need to buy multiple packages since each box comes with only one sensor and receiver. Since this is a computerized system, the sensor array will reach up to 16 individual units to cover your perimeter needs, and each unit will deliver (programmable) a different sound so you can isolate sensors based on specific chimes. 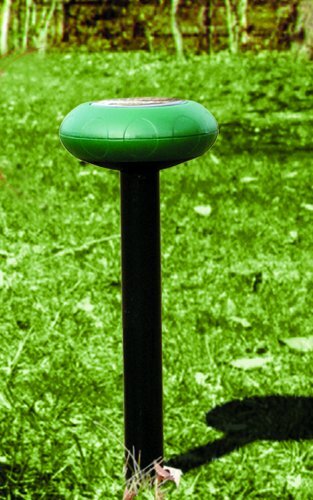 The detection range is 500 feet and can be placed in any area, even in dense woodlands or around buildings. You can also purchase a heavy interference model for areas where there are a lot of frequency noises. This is a wireless driveway alarm system, so each unit relies on 4 AA batteries to supply it with one year of energy. I personally prefer to replace the batteries after 8 months. The units are in fully protected PVC, and rubber sealed housings so they can withstand any weather condition. (Don’t expect it to survive a bushfire though). The receiver comes with a 12-volt relay that adds wired support for the external alarms. 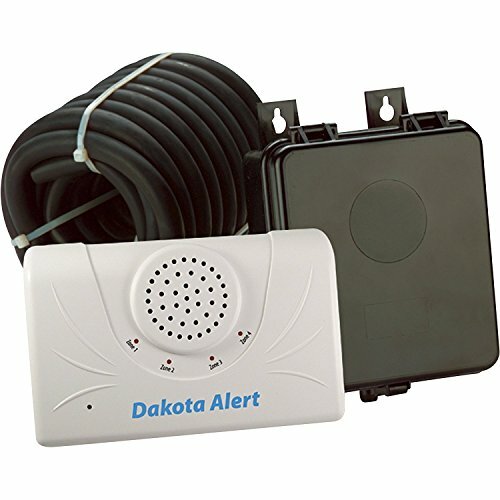 The Dakota VS-250 is a wired magnetic probe used as a driveway alarm system for detecting vehicles. This is not a motion system to detect humans, it is a magnetic sensor system to notify the alarms owner when the vehicle enters or drives over a focused area. As such, it is not prone to false alarms and will only trigger the alarm when enough metal is within 12 feet of the sensor. The probe is usually placed under the ground, in the general location of where a car will drive. It is hard wired to the receiver, which should also be placed under the surface for maximum protection as well as to reduce detection. The system is powered by a 110-volt outlet supply and has a simple on/off switch. The system comes with a 250-foot wire connector, and the receiver is powered by both an AC outlet as well as a 9v battery for instances when there is a power failure. 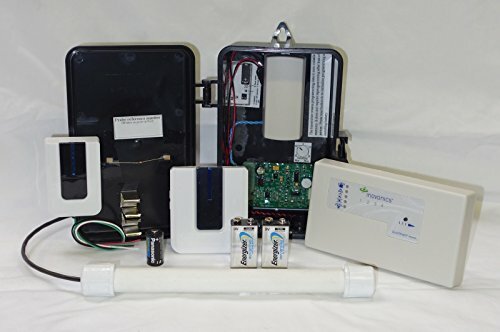 The Rodann Electronics RX&TX2000A Driveway Alarm System is a PIR detector, that can be installed for commercial as well as residential use. PIR systems are not affected by metal, shape or light, they work on heat detection and as such will trigger when a sufficient heat source comes within the sensors array. This model is not compatible with the TX/RX500 or TX/RX1000(non-A), TX/RX2000(non-A) or SL-40 models. 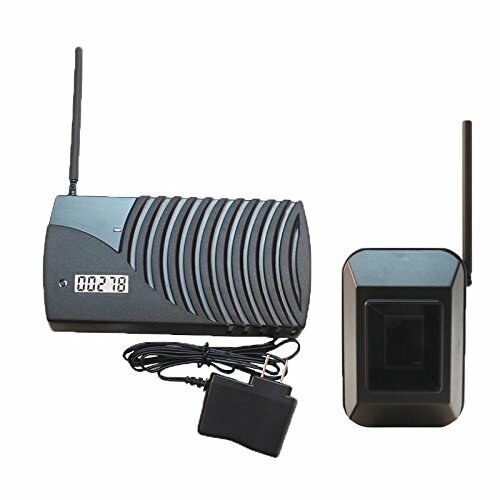 It has a range of up to 1,000 feet and is a full wireless unit that can be placed in any position. You need to place it with a clean line of sight or full effectivity. Another fine model from the Dakota Alert company. This unit is a wireless unit and comes with a 25-foot wireless hose that you place across the driveway, and the moment a vehicle rolls over the sensor, the alarm will be triggered. The receiver can be a position up to half a mile away. As with all Dakota Alert systems, this one is easy to install, and you can mount the transmitter anywhere around the hose area, but the best place would be on a tree or on a post, but out of view. The receiver and volume control connects to a 12 VDC output and relay energy source. The Transmitter uses a 9-volt battery. The CS202™ is a single-piece, vehicle motion detector that detects changes in the earth’s magnetic field when a vehicle crosses the surface near the probe. 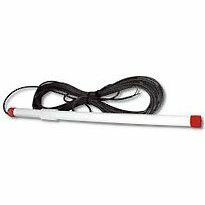 To install the sensor, you need to bury the CS202 probe adjacent to a roadway or buried under a concrete or asphalt roadway. This unit comes with a detection range of 12 feet and is only focused on detecting metallic objects such as cars when they roll near it. This is not a standard motion detector and will not detect humans. Sure Action is an American company with over 30 years of alarm development and production. They provide a very good customer service experience. 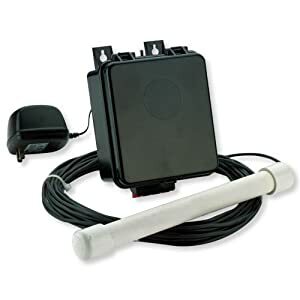 Sure Action Probe Driveway Sensors monitor is another magnetic field detector that is used to detect vehicles or large metallic objects that roll over it or near it, disrupting the magnetic field and triggering the alarm. For the prove to work, the vehicle must be in motion, in some instances during electric storms, when there is enough static electricity and lightening, the probe will generate false alarms. To counter storm influence, you can buy the GRND2 lightning surge suppressor and add this to the system. You can also buy another sensor and use that for a directional alarm activation. This is a Sure Action probe and driveway alarm system that comes with the ability to activate security cameras, lights, gates, and sounders. e vehicle to move at a speed of half a mile an hour, which is extremely slow and shows that this product is very accurate. It has a 14-foot detection range, and the batteries need to be replaced once every 9 months. The outdoor components are all sealed with a hand-dipped sealant as well as being housed in NEMA III material boxes that are used for housing electronic devices outdoors. Take note that the Invonics transmitters provide a range of 1.9 miles in the open air. So, these systems are very useful on farms and properties with multiple entrances and buildings. This is one special system since it incorporates two different sensor arrays that provide full accuracy and reduce false alarms. The Defender AL101 integrates both a motion detector and an infra-red detector. This way, moving objects such as branches will not set off the alarm system. This wireless system is modular, and that means that you can place the sensors anywhere you want, and you are not limited to any number of sensors. The AL101 also integrates with other alarm systems and can be used indoors as well as outdoors. The only downside with wireless systems is the reliability of the sensors when the power source declines. This raises reliability and cost, and you will be replacing batteries in all the sensor units at least twice a year. 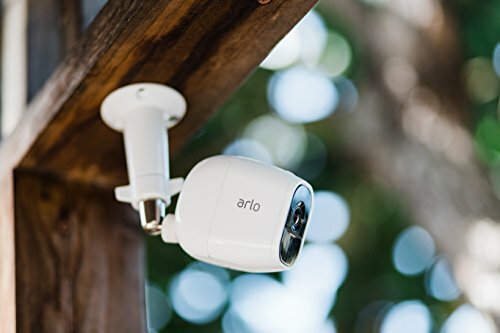 Each sensor is accurate up to 30 feet, is totally portable, so you can actually take it with you wherever you are traveling and use it as added security in instances such as when you are camping, or if you want to be notified by anyone coming close to while you perform specific tasks. These units are weatherproof and totally wireless., including the sensor and the alarm. The unit can be attached to an alarm system that has two wire alarm input. The unit has adaptable sensitivity control. There are many options for attaining secure premises. Budget is always the primary deciding factor. If possible, combine systems, don’t rely on any one system. Use motion detectors, pressure detectors, and metallic (magnetic) detectors, as well as PIR. Have cameras and a central computer system, to manage the whole array. This is not as expensive as you might think. If you can add camera’s, even wireless ones, do so, recording images as well as seeing what is happening in real life will add to the whole security array. However, bottom line: the best driveway alarm systems include the combination of at least two methods, one using pressure to detect large heavy vehicles that drive over or near the sensors, and a motion detector with PIR to safely detect humans. I also recommend you buy a wired system, the wireless ones are problematic and erratic due to their individual battery source. I personally prefer the cheaper long-term alternative that is a wired system. If you are already in a built-up home, there are ways to lay wires undetected.